"Salty and savory, the roasting method kills the natural bitterness of asparagus. Try it next to grilled fish or lamb." This easy technique makes asparagus tangy and savory. Enjoy! To remove woody ends, grab stalk of asparagus at either end and bend until it snaps. It will naturally snap where it starts to get tough. I used half the salt and still it was way to salty. otherwise it was good. I prepared the asparagus exactly as the recipe indicated, including all the optional ingredients. It was delicious, but very salty. I recommend reducing the salt to 1/2 tsp or 1/4 tsp. I make asparagus this way all the time! Didn't know it could taste so good! Do add the garlic though...I don't use the lemon juice. 400 degrees for 10 minutes works in my oven. Optional Parmesan, garlic, and lemon juice - a definite yes to all three! This is excellent and turned out perfectly. 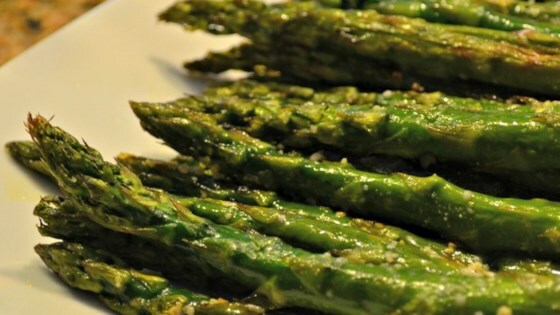 Nice recipe, however I prefer my asparagus to be a little crisper. 12 minutes was too long for the thick stalks I had... 8 minutes would be about right at 425. I prepared these as directed and they turned out great! I never liked asparagus before but I love it now.